Discussion in 'Announcements' started by Lauren, Mar 28, 2018. It is officially the last week of March, and we have some exciting new features to introduce to the community today! The Island merge is among us and we are ready to get this merge officially out and open to the public. Enjoy the brand new Islands, now known as the Fusion Islands! This Island is jammed packed full of creativity, carrying builds from ALL of the worlds that were merged within it. The Warzone is bigger and badder then ever and the community is sure to have a blast roaming around these new lands! Get your gear on, and your equipment needed to explore, because there's a lot of new things to be discovered! A quick little update has been released providing a new and efficient means of navigating through ones prefixes, along with a revamp of the beloved Prospector IKIT. The bunny shard is back in stores for a limited time only, along with a BRAND NEW RANK! The Eternal rank has officially gone on sale today and we are excited to see all of the proud new owners of the PINK NAME CLUB! Read below for all of the new rank benefits that you can receive. As per usual, the weekend sale has been activated with a randomized percentage off, along with a list provided of bug changes and fixes. Read more about these exciting features below! The prefix menu needed an update, and this week we have officially brought to you one that you are sure to enjoy. This update to the prefix GUI allows users to now see all of their unlocked prefixes immediately upon opening the GUI. For those of you who may have been sick of scrolling through pages of prefixes and hovering over them to find the ones you can use, now you can see them right from the start! The book and quill indicates the current active prefix that you are using, while the enchanted books display the prefixes you have unlocked. The Prospector kit has since been updated like you all asked for! A brand new axe has since hit this kit, along with the official removal of the Miner CKIT key -- we know, we're sorry. :( We have added more openables to this kit, along with three very nifty potions that are sure to help you gain riches and feel like an expert miner. For those of you who have this kit unlocked, enjoy summoning it for the very first time today! The Easter hunt is back on! It's been a long year since we've last seen the Bunny shard in stock, but load and behold, its finally here! Take advantage of this weeks big sale and rewards yourself with this exclusive Bunny Shard! Show off your festivities, along with your egg hunting skills and maybe you will see a new kit unlocked. The Bunny kit comes with all new armor that's sure to get your adrenaline jumping, your warzone rockets boosting -- along with loads of mob spawning eggs and some neat, new potions! Savage Games has been open to the public for nearly a year and half come next month, and for the entire existence of Savage Games, we had offered three unique ranks that our community could choose from in terms of supporting the server. Now, we bring you the forth and final* rank, the Eternal Rank! This rank comes with everything from the other three ranks that you are familiar of, along with lots of boosting of specific benefits. Some of these benefits include; a longer AFK time, a larger XP Booster, larger amounts of Islands warps, and more! You can now show off your server support through repping a new PINK rank title on all server platforms! - The ability to have flight in Spawn and Market Regions. - Enjoy 20 warp points that you can now place around your Islands! - Allow up to 45 members on your Island now with the new Eternal Rank. - An exclusive in game prefix that is only obtainable through becoming an Eternal Donor. - An exclusive in game Trail that is only obtainable through becoming an Eternal Donor. This will come later in the week! - Time it takes to smelt an item has since been decreased to 1 second for the Eternal Donor Rank. - The ability to bypass all openable animations and instantly open any openables. - Use of a new command: /cleardropzone. This command combusts all of your drop zone chests and any items inside fall to the ground! - Use of new command: /sellall. This command sells all items in your inventory that is sellable. - Early Access to beta testing sessions. Know whats coming out sooner than everyone else! - Added a chance to obtain an Eternal shard and Corrupted kit key from monthly rewards! - Challenge selector time frame decreased to 30 minutes. - The ability to earn up to 9,100 bonus XP! Last week we mentioned the new Island, or better yet the Fusion Island, where; Ice, Robots, Nice, Cartoon and Steampunk would be combined into ONE island. This week is that Fusion, as this post goes live so does the merger, which means that everything you have previously done up to now is saved and ready to be transferred to the Fusion Island if you are part of the 5 servers being merged. Upon joining in the hub, you will notice that there are no more icons for the Fused worlds and instead there now appears a single icon duly named the Fusion Islands. When you join the Fusion Islands you will be prompted to choose the data that you wish to transfer over from the 5 other servers. A confirmation GUI will appear when you select the data that you wish to transfer over. BUT BEWARE: You can only transfer over from 1 Island, so choose wisely for you will not be able to select another Island once your choice is accepted. HOWEVER: Prestiges*, Kits*, IKits and CKits will be brought over from all islands. 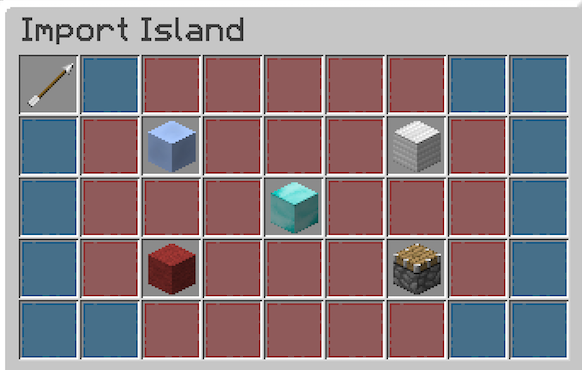 And all other player information will be transferred from the selected island. * - Prestige compensation must be submitted via Forum Post located HERE. *- Kit compensation for STANDARD KITS only must be submitted via the Forums located HERE. Immortal Kits that were purchased and unlocked, but lost due to owning duplicates -- will provide you a boosted, random Immortal Shard automatically when you merge your player data. These shards will only be usable by the player obtaining it. - Orbing of items both in and out of Fusion Islands will be disabled for a few days to ensure no issues are presented and items lost. - Kit Tokens will be disabled for a few days to ensure no issues are presented and items lost. - All donation store purchases will be restricted from being sent to the Fusion Islands until we are positive that the merge worlds are stable. RANKS will carry over to, all islands, including Fusion islands if purchased. - Please make sure you take screen shots of your prestiges from ICE, ROBOTS, NICE, CARTOON and STEAMPUNK. - Player made maps will not be moved over to the new island. Welcome to week 5 of our March updates! Why not set forth on your Skybounds adventures with a nice new rank, or a shiny new kit! - Spawn protection regions decreased even more now. - Fixed Space Set immunity complication. - Rank description in the store have been updated. - Added Rank specific kits category to kit GUI. - Added new /ClearDropzone command for Eternal Ranks. - Added new /CompactDropzone command for Eternal Ranks. - Added new /SellAll command for Eternal Ranks. .. Hey now, don't you judge us. It's been a very busy week! I can't wait!! Thanks to the Quality Assurance team who spent so much time testing for this update. Great job once again dev team, QA team, and Lauren thank you for working so hard on this update. Eternal Rank seems kinda like a slap in the face. "Instead of rewarding our most loyal players and top donors with features that they've been suggesting and asking us to add, we're gonna see how much more money they're willing to pay for said new features and add a whole new "donor" rank, which is required if they want to take advantage of them." Out of curiosity...why include flight at market for this new rank since people with savage already had /shop and almost never go to the market? Eternal Rank seems kinda like a slap in the face. "Here, give us more money for things you've been asking for us to add!" I also love how you omit the fact that you decreased island player capacity by 2, which seems like an important thing to add, Not including it just makes it look like you're trying to do it without anyone noticing. Not cool. Eternal Rank seems kinda like a slap in the face. "Instead of rewarding our most loyal players and top donors with features that they've been suggesting and asking us to add, we're gonna see how much more money you're willing to pay for said new features and add a whole new rank, which is required if you want to take advantage of them." Especially because those were all suggestions that got rejected. Great update! Perhaps I should get this new rank as an early birthday present for myself. Umm, looks to me like it's $119.99 normally, and $36.89 right now. You're the best at what you do Lauren. Couldn't ask for a better community manager. Thank you! Update nice, but savages just got scammed out of 20$. We paid 100$ and now it is 80$? Please upgrade the savages to eternal or give us back 20$. Well, I bought the rank. I gave in to the money grabbers at Savage Games, and now I am off to a fitful sleep. Savage was 100 $. Now, its 80 $. Even if i am Legend, i feel scammed. Going to lock this ahead of time. Enjoy the update and remember, no one is forcing you to purchase Eternal. Donation ranks are about supporting the server, not about what comes from the donation.